Farnaaz Islam and one of her art works at the 11th Contemporary Painting Exhibition organised by BAF going on in Guwahati these days. 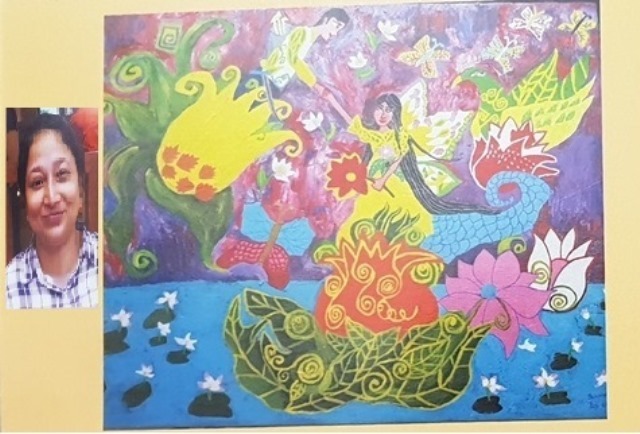 Guwahati, Jan 12: Farnaaz Islam of Guwahati is an engineer by qualification but a flourishing artist by passion. She is one of the two artists from Assam who feature in the 11th Contemporary Painting Exhibition organised by the Bengal Art Foundation (BAF) which is going on now at the Gauhati Artists’ Guild in Guwahati. BAF is today a platform and a beacon light for practising artists. The Foundation is committed to support artists around the country who are working with a contemporary attitude to art by projecting their works through exhibitions, art workshops, art seminars at major centres and creating awareness among the collectors and the connoisseurs of art in the country. The Foundation is also inviting artists from various countries to integrate and create a bonhomie among the practising artists of the world. It is indeed an honour and privilege to be featured in a BAF exhibition. Farnaaz has attained the feat at an early age. Farnaaz did her schooling at the Blue Bells School and Holy Child School in Guwahati. Her father is a doctor and a professor at Gauhati Medical College and her mother is a lecturer. She herself has done an M Tech in Electronics and Communications Engineering. But more than her profession, it is her passion for painting that is taking her places these days. Expressing gratitude to her parents, Farnaaz says, “I have memories of my parents dropping me at Gauhati Artists’ Guild, my alma mater for painting lessons, and then my parents taking me to various art competitions, and me getting a 2nd prize in an art competition organised by the Productivity Council of India when I was just a KG student.” Many prizes have come her way in subsequent years and there has not been any looking back ever after that. 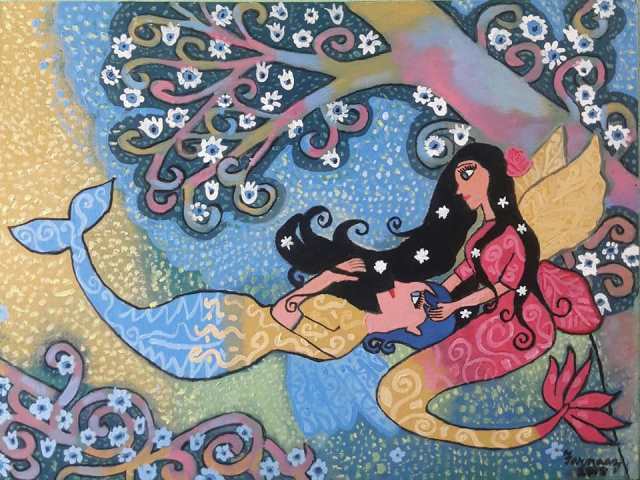 Farnaaz has in the recent past organised a solo exhibition of her paintings at the State Art Gallery Guwahati. It was Debananda Ulup who introduced her to Ashoke Roy, the founder of Bengal Art Foundation paving the way for her to make an entry in the current exhibition in Guwahati which commenced on January 9 and will continue through to January 14. Asked about her most memorable experience, Farnaaz says, “My most memorable experience was my grooming at Gauhati Artists’ Guild … at the age of 12, I completed the Visual Arts course there. It was an awful feeling, I can’t express it in words.” As for the future, Farnaaz wants to continue experimenting with acrylic and water colour using various styles, and learn more and more tricks of the trade until she is able to open her own you-tube art channel. Across the world, genocidal states are attacking Muslims. Is Islam really their target?